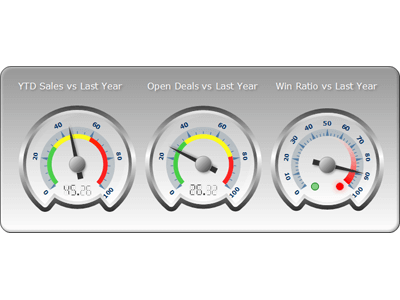 Gauge Indicators are showing important values, ranges or states on the gauge. Nevron Gauge can be used for the creation of complex gauges, KPIs, Scorecards and Dashboards. The example demonstrates combination of Radial Gauges with Needle Indicator, multiple Range and State Indicators. Gauge Indicators are showing important values, ranges or states on the gauge. Nevron Gauge can be used for the creation of complex gauges, KPIs, Scorecards and Dashboards. The example demonstrates combination of Linear Gauges with Marker Indicator, Range, State Indicators and Numeric Display. Gauge Indicators are showing important values, ranges or states on the gauge. Nevron Gauge can be used for the creation of complex gauges, KPIs, Scorecards and Dashboards. The example demonstrates combination of Linear Gauges with Marker Indicator and Range Indicators. Gauge Indicators are showing important values, ranges or states on the gauge. Each gauge can contain an unlimited number of indicators. Nevron Gauge can be used for the creation of complex gauges, KPIs, Scorecards and Dashboards. The example demonstrates Linear Gauge with Multiple Axes, Marker and Range Indicators. Gauge Indicators are showing important values, ranges or states on the gauge. Nevron Gauge can be used for the creation of complex gauges, KPIs, Scorecards and Dashboards. The example demonstrates combination of Numeric (LED) Display with State Indicators. Gauge Indicators are showing important values, ranges or states on the gauge. Nevron Gauge can be used for the creation of complex gauges, KPIs, Scorecards and Dashboards. The example demonstrates Radial Gauge Knob Indicator.